For the sixth year of BBC Worldwide’s CBeebies on Tour, XL Events joined in the fun once again, supplying LED, camera system, playback and custom LED set elements. 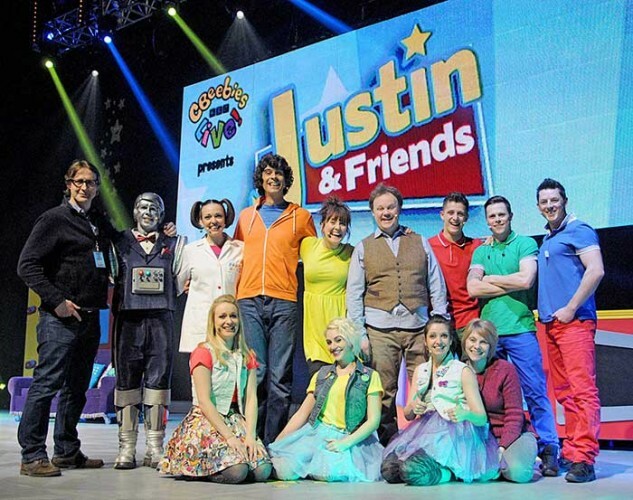 The huge tour, which saw Justin Fletcher MBE bring together his favourite CBeebies characters for the very first time, was a brand new Easter egg-stravaganza. The spectacular rock and roly-poly show, which toured UK arenas across the three week Easter school holiday, playing up to three shows per day, included Robert The Robot and Little Monster from Justin’s House. The main upstage screen was made up of XL’s Lighthouse R7 LED, with five additional custom-built moveable screens on the stage constructed from Pixled FX-11. "As always, it’s a pleasure getting the team together for another CBeebies run," commented XL Events’ director Rich Rowley. "This year we changed the mix slightly in replacing the majority of the constructed set elements with five custom-built LED screens on moveable dollies. This supplied dynamic set content and also allowed Justin to interact with his alter-ego…and other characters from Giggle Biz." Content for the screens was played back via one of XL’s Catalyst media servers, driven by a grandMA2 Wing controller. Nev Bull managed the Catalyst for XL, with Tim Bolland and Ade Moore looking after the LED screens. The script writer and director for Justin & Friends on tour was Will Brenton. Production manager Nigel Mousley commented: "XL brought their usual expertise and skill to the production, however in this show we particularly needed a strong partner to help develop the scenic LED screens. We had to find a way to represent Justin Fletcher’s different characters and ensure audiences would see as many of them as possible! The screens worked fantastically, and the feedback has been marvelous."